It is with great pleasure that I present to you all Hard Ops 8. This release was focused on refinement and cleanup. I’m sure by saying that, we have cursed ourselves with new bugs. In the rush to 0079 it became apparent that a moment to reflect and refine existing systems while cleaning out antiquated code was needed. This release is a multi-part where we will expand on the 8 release with additional features. I just wanted to get you guys on the same page so I can at least demo the software without being in the future. DO NOT USE INSTALL FROM FILE. IT WILL NOT WORK! Also user defined directories have issues also! I recommend putting the contents in the zip in the Blender Add-on directory of the system. Installing from file may have an issue. My installation path is here on windows. So first things first. Hard Ops has a different drawing system. This differs from 007 and 0079. The initial system was designed by myself and JL, however for this release AR took a shot at redefining the Hard Ops drawing. This was something we were experimenting with in 0079 however now it a part of Hops 8. This is still something being refined and we have much more planned for the updated drawing system. The newer system is a bar at the bottom of the screen and was just an idea to make it more appealing in full screen. Also to try and present it as a notification. Pro users can turn it off if needed but we still want to add clickable behavior to the text itself so that might be a thing in the future. As I said this is just the start. The drawing panel is a new addition to Hops 8. This is where the features get interesting. ThemeGrabber>> sets theme to theme based off of current Theme. The theme grabber is one my favorites because no matter the theme you have. We can make Hard Ops fit for you. So I would recommend the theme grabber to all. However two alternative preferences exist. The themegrabber was quite important to me personally and I pestered AR alot in order to fine tune it to be the way it is now. For customization, the border color and secondary border color are the two main ones that you want to change if setting something manually. The drawing is just a small part of the improvements we have in store. So the dependency mirror mirror has also been integrated. This means you no longer need mirror mirror. 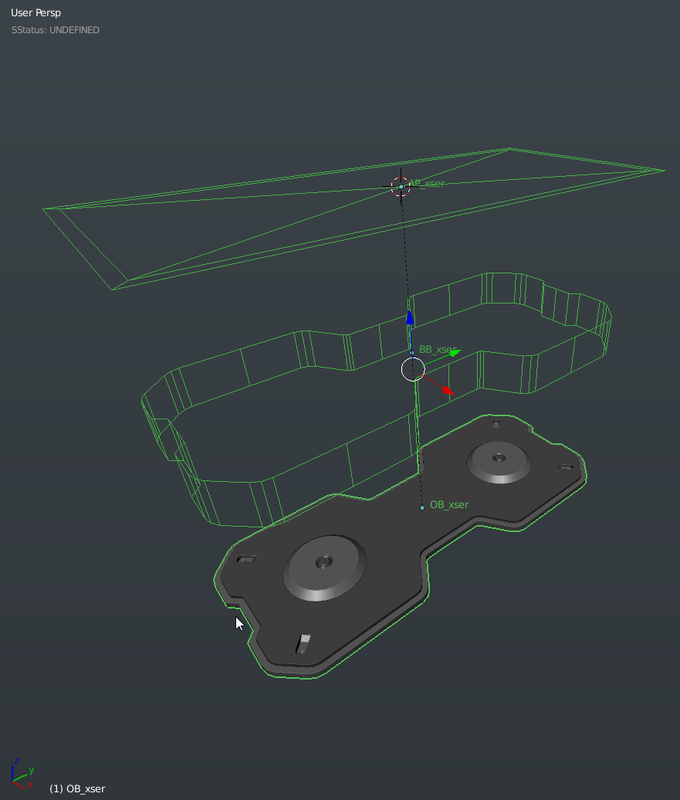 This was done so that it would be integrated into the new drawing system as well as expand on it in the future through Hard Ops and begin connecting it with BoxCutter. The hotkeys of alt + shift + x / y / z for mirroring across a specific axis is also still present and will resolve the hotkeys if you disable mirror mirror before activating Hops 8. The new features added to the Hops system we’re about to go over aren’t the most glamorous but definitely have their uses. The first is Demote. This is an experimental option that simple removes crease and bevel width while keeping sharp. This is part of a workflow I have been experimenting with called Demotion. Which is basically the idea of removing bevel weight and immediately beveling manually. I use this feature quite a bit so it has been added to the edit mode Q menu if pro mode is enabled in preferences. After demoting a selection I am able to bevel it manually. This is something I want to expand on further however at this time. It is a manual form of cstepping in my opinion. Technically it is the clean ssharps without the clean sharps checked. Its just quicker than clicking that and pressing F6 then clicking twice. So the next essential but less exciting idea is sstatus reset. When you take a mesh and csharpen it. It’s sstatus changes and therefore so does the Q menu that comes up. When you want to reset it back to the start without affecting the mesh or modifiers, you now have status reset. It is like status override except the only state you can return the mesh to is undefined meaning it is handy for starting over the Q menu process. I may do a video or blog post explaining this down the road. But the idea is that the menus will realign due to workflow and be adjustable for particular workflows and adjust dynamically. This is all theoretical at this moment but expect it to be fleshed out by project’s end. In the above image, I went from undefined, to csharp to cstep and back to undefined in order to keep the menu showing the items I want. This is aimed more for those who are quite familiar with the ideas behind Hard Ops and are utilizing the sstatus system. Additionally there were many glitches that were nuances that have been resolved. Csharpen / Cslice / Rebool – now keeps your bevel information without modifying it at all. This was a glitch since the start and was something I was used to. Over the course of Hard Ops it was harder to find but come version 8 it was resolved as soon as it was pointed out. There was also quite a bit of code cleanup so I expect a few bug reports. The benefit is its lighter to load and isn’t wasting your memory with antiquated operators that have been remade many times over. Boxcutter integration was also a large focus for Hard Ops 8. 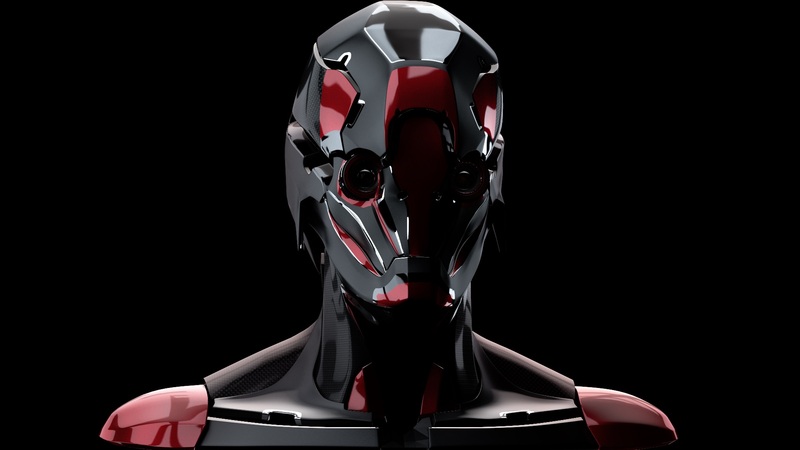 While Boxcutter is a separate project with a separate team the leader is our own AR. We have been working on both Hops 8 and Boxcutter at the same time and there have been many small improvements made to empower both tools. This part is about Boxcutter integration. 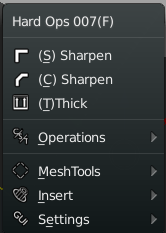 When you draw a mod shape now the mesh is given a status that gives it a special menu. 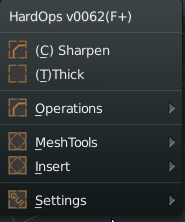 This menu allows for Hard Ops functions to be used quickly for box cutter mod meshes. This was something I discussed quite a bit. The ideology of box cutter is no menus and panels. So the connection with Hard Ops was a no brainer. 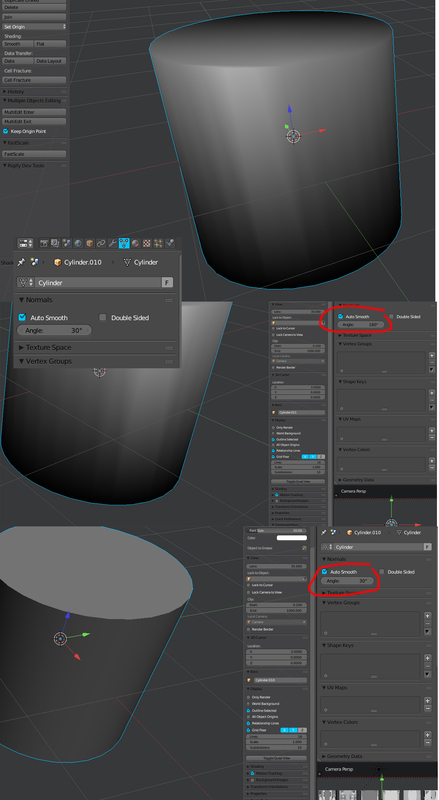 Now boolshape meshes will have a menu with bwidth (which applies no sharpening), array and tthick (which allows you to panel a boolshape instead of cutting). If you want to make the object real. That is what the sstatus override is for. To reset the status and start over. The integration go a little deeper however on the surface this is what is most noticeable. 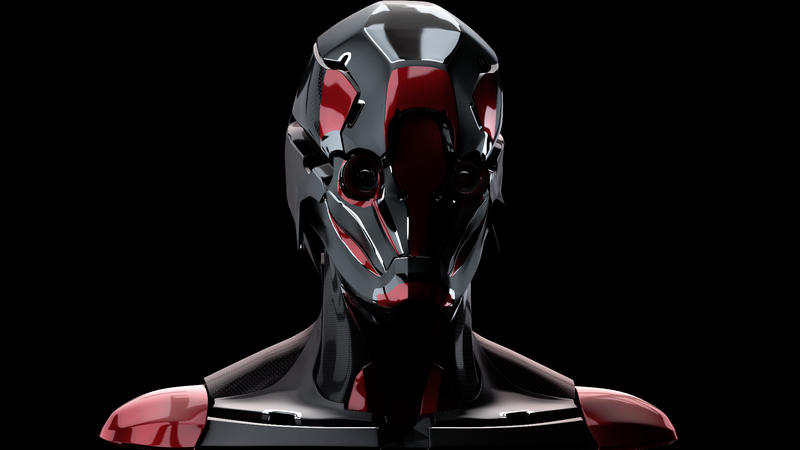 You are also able to use mirror mirror with modshapes in order to boolean with symmetry. This is something we may expand on even further in the upcoming updates however this covers most of what is new in Hard Ops 8! Also 2 new inserts! I meant to add about 20 more but that may come later when the new system is in. 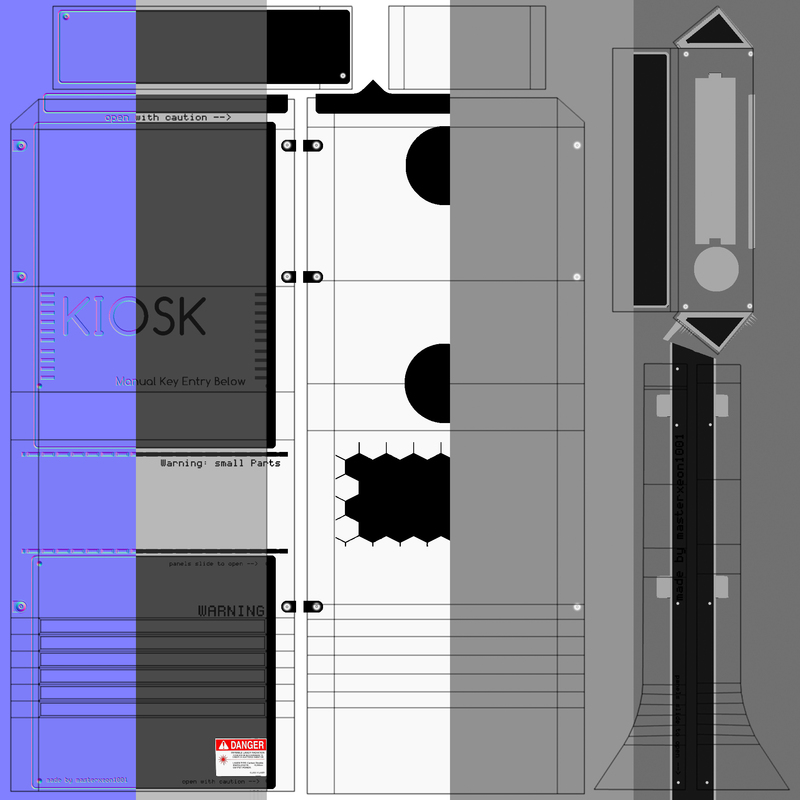 Box cutter logo and copy machine button panel. Just in case you need some buttons. In closing Hard Ops 8 is a release that we plan to expand on within the 8 series with a few more special features that aren’t ready just yet. We have significant changes planned and can’t wait to show you what that is. 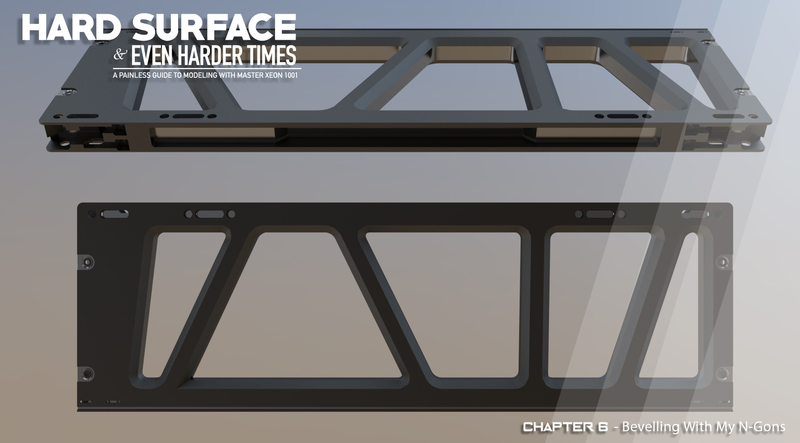 So you won’t be hearing about Hard Ops 9 just yet. This update still is in development. So like the 0079 release I try to release it earlier to allow more time to refine and bug fix after reports come in. I thank everyone who has been a part of Hard Ops and it’s path. I am eternally proud of the works the users put out and it is always inspiring to the team as well. 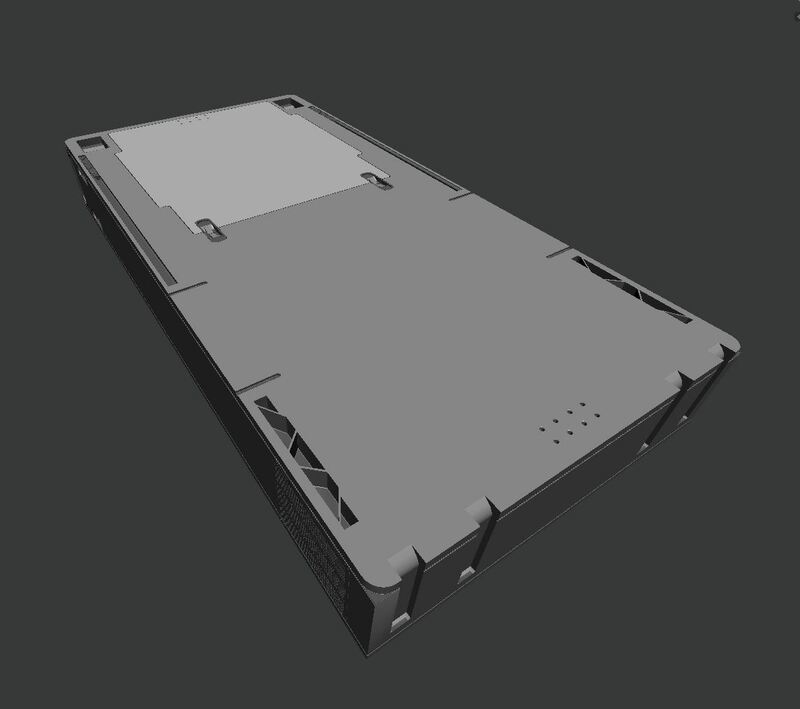 Boxcutter’s latest update is out and is a massive update. Jibble Update And Free Kiosk! 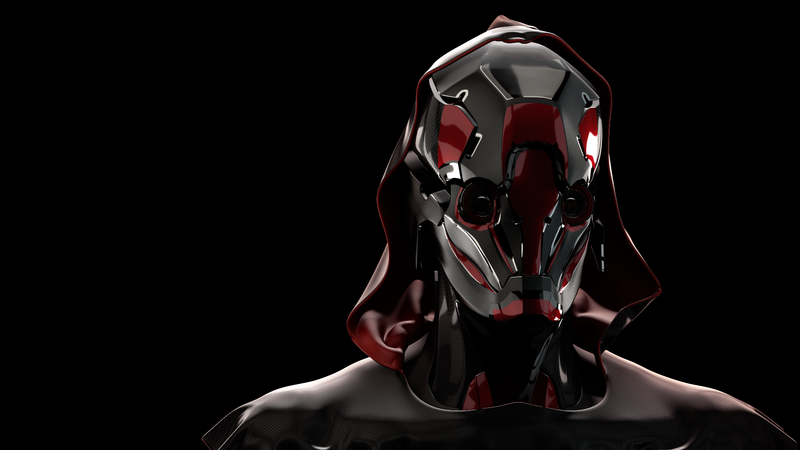 So recently I did another iteration of model Jibble. He’s a nice test to use when it comes to refining techniques. I like the way he came out and plan to continue on him. 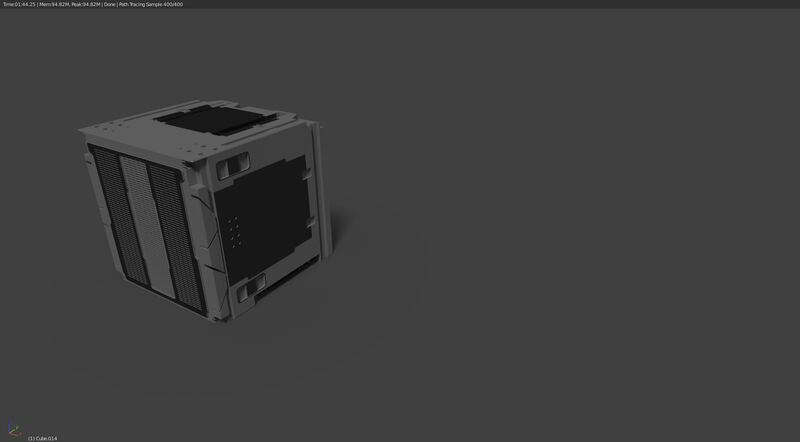 The rendering is just 3 mesh lights and a black environment. I was pleased with the result. Now to make him talk. There’s also a timelapse! 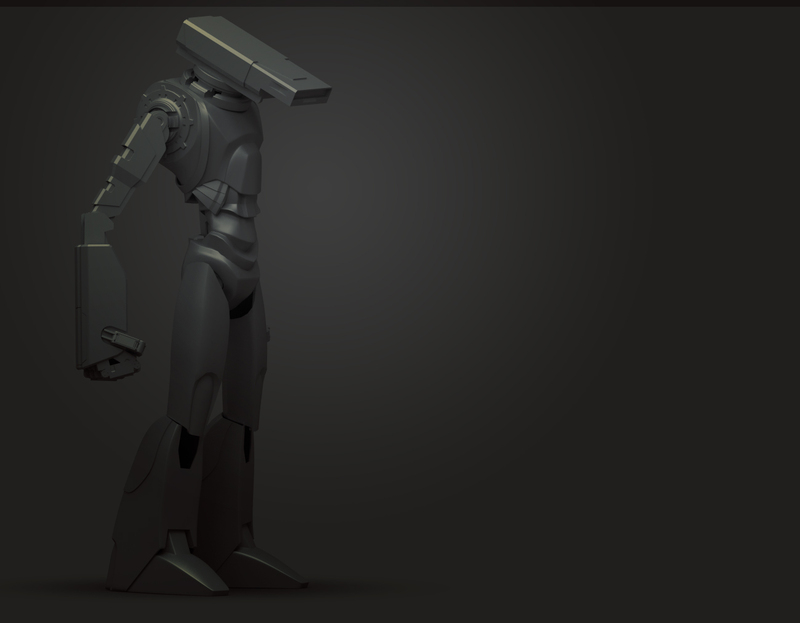 For those wanting the files they are part of this gumroad. Also Patrons get it as well! 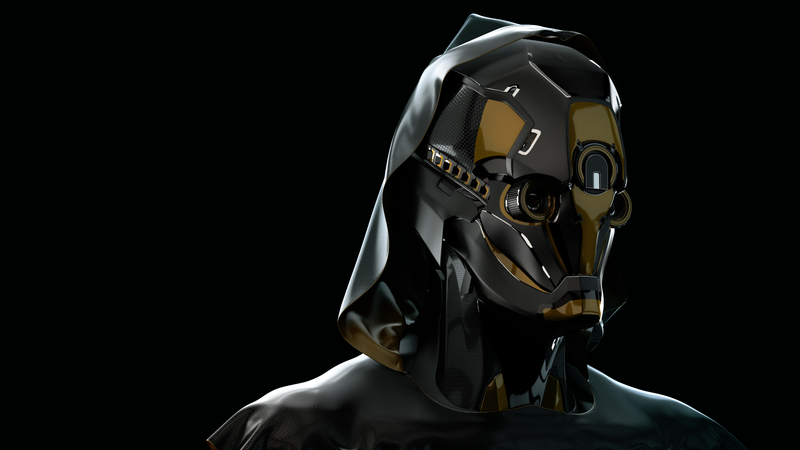 The hoodies, the iris and even the model and inserts! I hope you all enjoy. Deux coming soon! 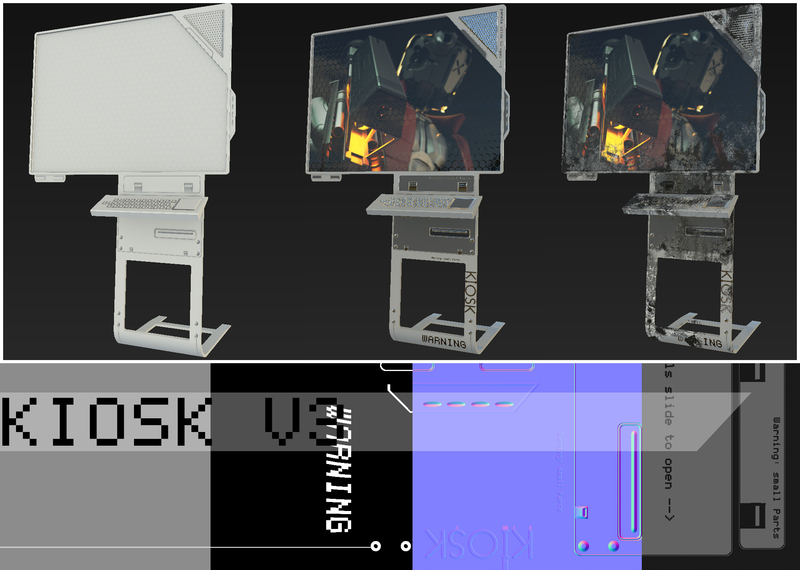 Also I did a kiosk as a test of Blender/nDo and Substance Painter. Gave away all the files for that too, and for free might I add. 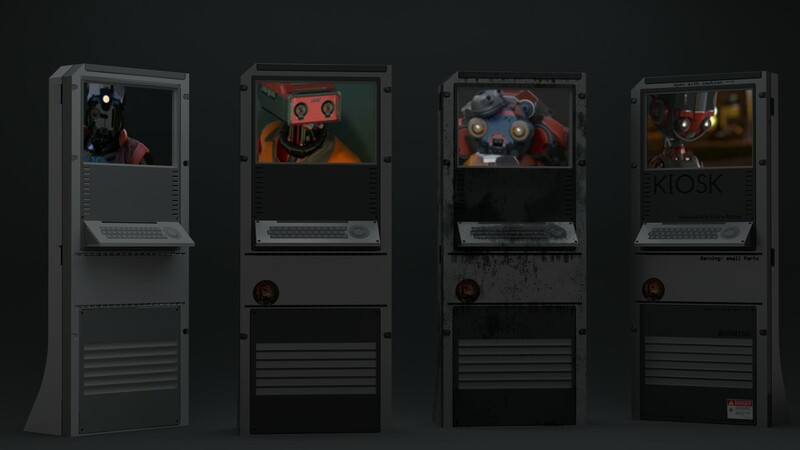 The kiosks have an artstation!